Jet Blast & Noise Specialists. For over 60 years, BDI has been finding innovative solutions for the aviation industry. We have become a world leader in designing, manufacturing, delivering and installing Jet Blast Deflectors (JBDs), Ground Run-Up Enclosures (GREs), and Visual Screens. By focusing exclusively on jet blast and run-up noise, BDI has earned a reputation for its expertise, integrity, and long-term customer commitment. Since 1957, BDI has been the only company in the world to offer a full line of blast deflectors suitable for all types of military and commercial aircraft. The diverse range of deflectors includes light duty taxi/breakaway power models, heavy duty full power run-up models and afterburner models. BDI offers turnkey design-build GRE facilities that use patented components, proven designs and a spotless track record of successful installations. BDI's revolutionary ground run-up enclosures are designed with two, three, or four walls suitable for all aircraft in various wind conditions. The combination of the aerodynamically advanced Stabile Flow™ design with the effectiveness of the Noiseblotter™ acoustic panels and rear VertiVent™ provides a stable, effective GRE with very high usability and noise reduction. End around taxiway (EAT) visual screens are placed at the end of a runway to enable pilots to better discern when an aircraft is crossing the active runway versus operating on an end-around taxiway. 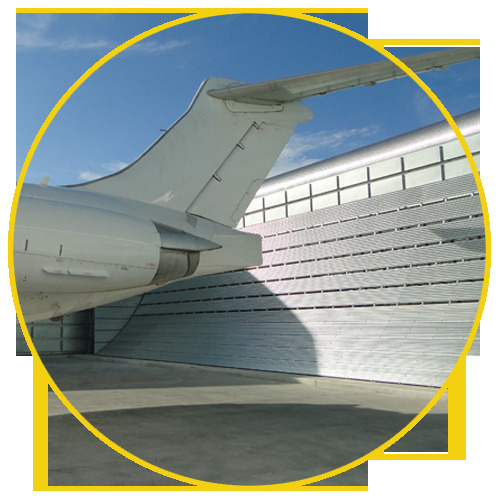 BDI visual screens are fully compliant with FAA guidelines and are designed to be durable, resistant to weather, frangible, and resistant to wind load. With more than 60 years handling military projects, BDI is an expert at resolving the many unique challenges military projects can present. BDI supplies a full line of deflectors for military application ranging from taxi-power deflectors for aircraft such as the C-130, KC-135 and C-5, to full power run-up stands for the most advanced fighters like the F-22 and F-35 aircraft. BDI's design and engineering team are capable of meeting the constantly evolving requirements of military projects worldwide.